The unique selling point of an LED UV printer is the unique drying method called UV curing. UV curing uses light instead of heat when drying, meaning it takes only a couple of seconds to harden the adhesives, inks or coatings that have been used. This is much better than the traditional and outdated printing methods because older technology made coatings shrink by more than half, so they weren't too kind to the environment either. We won't go into the science involved in UV curing right now. 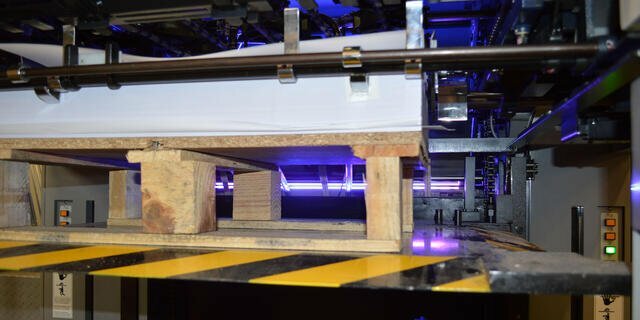 But you can see the detail behind it in our blog post - What Is UV Curing And How Is It Used In Printing? The drying process is now so efficient that the turnaround of printing jobs has been reduced by around 40%. Faster turnaround times still ensure the quality is perfect. Two birds, one stone. With LED UV technology, there's no solvent to evaporate which means no environmental pollutants are formed. Also, it uses less power than traditional print technology as machines have instant on/off functionality to reduce standby consumption between jobs. This helps reduce overall C02 emissions. This can be used to help contribute to your sustainability goals. If you're a company that has to use large printed messaging, then using an eco-friendly method will help compensate for your increased carbon footprint. When thinking luxury, don't assume that you have to stick with ordinary paper. Take advantage of LED UV and its capabilities and don't be afraid to try silk, Constellation Snow, Lux or even uncoated paper. All of these stocks provide unique and distinct advantages that further help your brochures stand out. Constellation Snow features an embossed linen effect which feels really smooth in the reader's hands. Lux also has a unique texture which LED UV can print on, providing an understated, classic appearance thanks to the ultra-thick, triple layered card. Silk is a popular choice when it comes to luxury because of the low surface sheen which helps the colours appear brighter and more defined. However, the best stock to go with when using LED UV technology is uncoated paper, as the soft finish and tactile quality isn't compromised, while the ink appears much flatter and that results in colours appearing much sharper. The versatility of LED UV machines can be stretched even further, as inks can be applied selectively to build up embossed objects, letters and custom textures. Whenever you try something new, you always worry that it might not be as good as what came before it. You won't have that worry about that with an LED UV printing press, as the colours are enhanced to their full potential consistently. 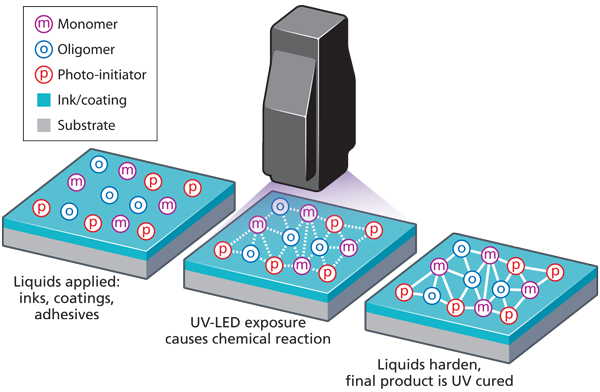 A diagram showing how UV light instigates a chain reaction, resulting in the curing of materials such as inks or adhesives. As ink doesn't sink into materials using a UV LED machine, the colours always appear much sharper. Once printed, colours also appear much brighter and more vivid to provide the best visual presentation. That's something you simply can't compromise on. The point of a luxury brochure is to show off your premium products in the finest quality possible. That means the images need to be professional, and the images need to feature colours that will highlight the tiniest of details. An LED UV printer uses the unique drying method to ensure that your company receives luxury brochures of the highest quality. With LED UV printing, ink set off - which is when ink transfers from one sheet to another - is eliminated. This ensures that the original characteristics of your brochure will remain as there's no need to apply a sealing coat. This way, no anti-set off powder spray is needed so there's no dust, no blemishes and no markings ever appearing on your brochure thanks to sealing coatings. This cutting-edge technology ensures that you're always getting stunning, bespoke results - regardless of your project. Once printed, you and your readers will be left seriously impressed with the superior quality that instantly captures attention. It's important that you're providing readers with a quality brochure, as they can quickly assume that poor quality materials will result in poor service because it's clear that not enough effort has been put in. On the other hand, when readers feel that you've gone to great lengths to create the most luxurious brochure around, they'll know that the service and products you provide replicate that. The quality associated with your brand is in the reader's hands, so it's the perfect time to make an impression. By using an LED UV printing machine, you'll have the many benefits that it brings which only improves the overall quality of the brochure. A quality brochure or product is worth keeping in its own right. No throwaway leaflet or social media post offers this longevity of brand exposure, and help from LED UV printing shows that you take pride in your products. Numerous factors go into creating a luxury brochure, and the right printing technique is just one of the major aspects you need to consider. In this blog post, we explained what an LED UV printer is and what the benefits are of using this brilliant piece of technology. But for even more tips and advice, ranging from stock choices to photography, download our free guide on how to produce a luxury brochure.